Music invades the streets of Pamplona right from the very start of the San Fermin festival, to carry on non-stop until the last Charanga (informal brass band) finally withdraws in the early morning of July 15th. Music is a key part of the fiestas and, as such, is much, much more than the events featured in the official program. The songs written by Manuel Turrillas for the Peñas (San Fermin social clubs), intermingle with the exotic sounds of street musicians, the Basque Txistus (flutes), classical music, and the rhythms of the bands of music marching through the streets in the mornings. At night time, there are yet more Charangas, mixed with canned music escaping from bars and pubs, together with open air concerts given by the latest pop groups, competing with other types of music such as jazz, salsa or merengue in the city's squares. A sound track which is a blend of programmed acts and improvisation, modern and folk, formal and informal, all taking place in the same festive atmosphere. Apart from this, almost all the acts organised during the fiestas are complemented with their own musical accompaniment. Good examples of this are the Parade of the Giants and Bigheads, the Procession, the Pasodobles in the bull ring and the Dianas (bands playing through the streets at day break as a form of early morning reveille). The official program features a wide range of concerts, plus Verbenas (open air dances) and other musical events covering many different styles of music. As would be expected, all performances are in the open-air. Although the program is generally very similar, year after year, it is still a good idea to check the time and place beforehand. The San Fermin events are organised in the squares, parks and gardens around the city, with little variation from one year to the next: the Plaza del Castillo square; the Plaza de los Fueros square; Plaza Compañía square; Media Luna park; Plaza de la Cruz square; Paseo de Sarasate walk; Taconera park; and plaza Antoniutti square. Throughout the fiestas, all these places host musical events ranging from jazz, pop-rock, electronic music, rumba, salsa, folk and Jota (regional songs) exhibitions. The notes of the Biribilketa by Gainza mark the start of the San Fermin fiestas, just after the town hall clock strikes twelve o'clock midday on the 6th July. The piece is played by two indisputable protagonists: the La Pamplonesa municipal band and the group of Txistu players. These two groups, and the Gaiteros (pipers) are an essential part of the festivities here. Once the San Fermin fiestas are underway, one of the first events is a big regional music and dancing festival. Just an hour after the rocket has been fired to mark the start of the fiestas, enthusiasts and tourists alike flock to the Plaza de los Fueros square to watch the dancing exhibition and discover the many different traditional regional dances still danced in the villages spread across Navarre. In this event, groups of Danzaris (regional dancers) perform dances such as the Aurresku, a fast Jota from Ochagavía, a "paloteau" (using sticks) from the southern area of La Ribera, a Dantza de Zuberoa and a Multidantza. The dance festival ends with the traditional "Baile de la Era" in which many spectators can also take part. At seven o'clock in the afternoon, on that same day, the Alarde de Gaiteros (Pipers' Parade) takes place from the market in the Old Part to the II Ensanche (city extension). The Dance Festival is the first of a series of morning concerts which come under the name of “Euskal Musika" in which a number of traditional musical groups perform at twelve thirty midday in the Media Luna park. Just the right place to become familiar with the sound of the Trikitixa (type of accordion), the Txistu and the Gaitas, and also the rhymes of the Bersolaris (spontaneous verse sung in Basque). 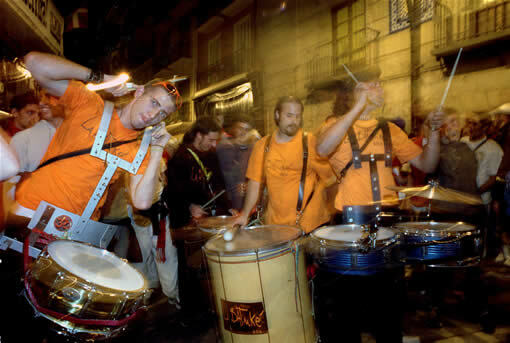 The most important of these concerts is the traditional Alarde de Txistularis (Txistu player parade) which generally takes place on the first Sunday in the fiestas. Professional musicians of all ages and from all places take part in this exhibition, which is a highly popular and well-attended. Also at midday, various groups of Joteros (singers of regional songs called Jotas) offer Jota recitals in the Paseo de Sarasate. The famous Hermanos Anoz generally take part in this festival. Band music is also present in the mornings during the San Fermin fiestas. From the 8th July onwards, until the end of San Fermin, the best municipal bands visit the city to perform in the Plaza de la Cruz square at one o'clock in the afternoon. For lovers of classical music, each year the internationally renowned Pamplona Chamber Choir Group offers a concert in the Gayarre Theatre. Each evening during the fiestas, the City Council organises a wide range of musical events, in which there is something for everybody. At nightfall, music from the open-air dances provides a festive ambiance. The quieter events, suitable for the whole family, are those held from 8 pm onwards in the Paseo de Sarasate and the Plaza de la Cruz. The latter lasts till half past one in the morning, with an interlude for the firework display. A little later, at 9 pm, the Plaza del Castillo becomes the stage for an event called "Música de aquí" (music from here), in which the locals dance their regional dances to the traditional sounds of the Txistu and Gaita. The dancing ends with the typical "Baile de la Era" a traditional regional dance. Other styles of music such as the Merengue and Salsa can be found in the Plaza de San Francisco whilst, if you are looking for a good jazz concert, try the Plaza Compañía square where, from 10th to 13th July, performances are given by musicians such as Chucho Valdés, Baldo Martínez or Nicholas Payton, with tributes such as the one paid by Javier Colina to Tete Montoliú. The Firework Display is a mandatory interlude in the music and dancing, which resumes once the last cartridge has gone out. The open-air dances in the Antoniutti parque and the la Plaza de la Cruz square continue well into the early hours. After midnight, the "Salida de Bandas" takes place from either the town hall square or the Labrit Frontón court, a procession of bands of music through the Old Part. Yet another success are the live rock group concerts offered in the Plaza de los Fueros square. These start half an hour later and the groups invited play heavier music, blues, rock mestizo, hip-hop, Latin fusion rock for a younger audience. Over the last few years groups such as Barón Rojo, Los Ronaldos, La Frontera, Raimundo Amador and, of course the Navarre group called Barricada, have all played here, accompanied by smaller, local groups.